Real Estate -To Be Or Not To Be Disrupted? What is transforming the movie, taxi, music, retails, and hotel business? The are many factors and market forces at play. Some believe late fees and rental policies killed blockbuster and led to the rise of Netflix. Dirty cabs and high fares made Uber a household name. Poor service and experice created the beast know as Amazon. Limited availability and high prices opened the door for AirBnB. Being stuck buying a full-length album just to get the one or two songs we like made us change our tune for Apple. 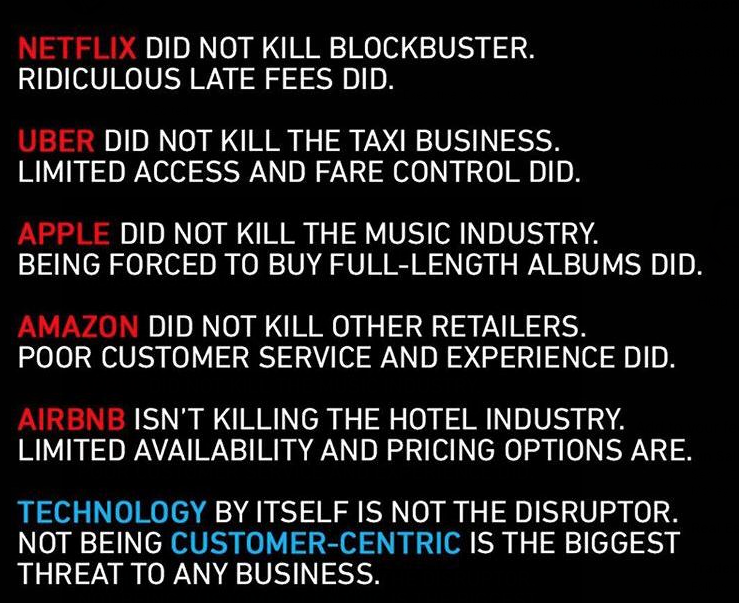 While all these issues played a role in the change and disruption, I would argue there is a more important and powerful link that all of these companies share that make them great. It can be summed up in one word. CONVENIENCE People gravitate to convenience. People will pay for convenience. People will tell their friends about convenience. Convenience is the cornerstone of customer service and experience. Now let's turn the conversation to real estate. Being in the real estate business, I have access to listing data from a variety of sources. What website/app is my go-to for real estate listings? Zillow. Zillow may not be perfect but it is very convenient. House details, surrounding listings, recent solds, price and rent zestimates, and you can even check the sales history. All this in 20-30 seconds or less. Ok, so there have been a variety of companies that have made the home search faster, easier, and more accessible. What about the transaction? Selling or Buying or a home is the most over-complicated and inconvenient experience. We can argue all day about the reasons for the rise of these companies and business models. They all have one thing in common. They are consumer centric business driven to make the consumer experience better, faster, and more affordable. Is your real estate business consumer centric?